Stainless steel is great because it is a clean surface that is known for its resistance to rust and corrosion. That’s what makes stainless steel a great choice for kitchens or bathrooms. However, if you’ve owned stainless steel you know that stainless doesn’t mean spotless. Stainless steel shows a lot of dirt and grime, which lower its chances of resisting rust and corrosion, but thankfully it’s pretty easy to clean. Sometimes water is all you need to do the trick. Some warm water and a cloth will go a long way with things like dust and dirt. Be sure to dry the water off of the stainless steel to prevent water spots. The minerals in water as it dries can leave little water spots which take away from the real clean and nice look of stainless. A microfiber is a great option for this as it collects almost all of the water and it won’t scratch the surface of the stainless. A mild mixture of warm water and dish soap is a super effective cleaner for things like grease and hard to remove dirt on stainless steel. A drop or two of dish soap in a spray bottle of warm water will go a long way. Wipe down the dirty area and rinse the stainless to prevent soap and or water spots. Be sure to wipe down with a dry towel to prevent any further water spots left from minerals in the water. Glass cleaner is the perfect remedy for those pesky fingerprints left on your stainless. Fingerprints are the most common complaint about stainless steel, but a little glass cleaner or household ammonia will make that a worry of the past. The best application is to spray a light amount of cleaner into a microfiber cloth and wipe your stainless in a circular motion. Spraying the stainless directly can leave spots and can waste cleaner. Also, the circular motion is important because simply wiping up and down will leave streaks. Some of the newer kinds of stainless steel can resits fingerprints, but I haven’t heard of one that is 100% effective yet. Stains that are difficult to remove, scratches, or just need a good ole fashion polish, stainless steel cleaner may be your best option. Some of these polishes and cleaners can help minimize scratches when removing stains as well as polish your stainless steel to prevent further scratches and grime. Before going all gung-ho on your stainless, find an inconspicuous spot to test the cleaner. Most cleaners have very specific directions and if not done properly can leave your stainless steel more gunked up than what you started with. The most common thing that I have trouble with cleaning the hood in my kitchen. It’s hard to reach and usually has a pretty thick coat of grease on it after a few months, no matter how many times it’s cleaned. 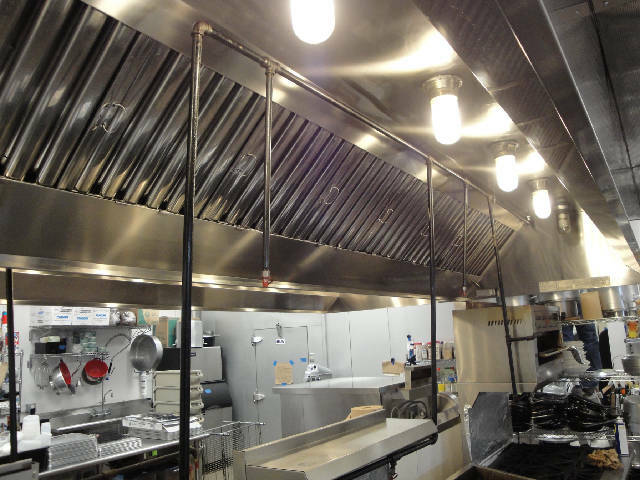 For situations I recommend calling a professional, I like to call for commercial kitchen cleaning in Sacramento, CA. That seems to always be the best way to get my hood and kitchen clean and get the stainless around the kitchen looking brand spanking new.